Pancake Day – there really is no avoiding it when you have children….or are a big kid yourself! Typically, a pancake isn’t a “bad” food – it’s just flour, milk and eggs. The issues can begin with the packet mixes, the frying, the toppings and the quantity. If you make it yourself there is no extra sugar which does help soften the overall load and it is very quick and easy to do yourself. A basic recipe from the BBC GoodFood website simple has 100g plain flour, 2 large eggs and 300ml milk. It really doesn’t get more simple than that! 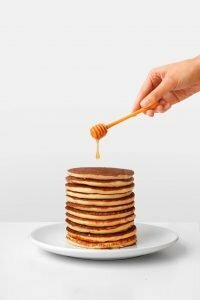 According to Statistics View on average we eat just 2 per person……..that seems low in my experience although the current Guinness World Record for a man is 72 (48 for a woman) in one sitting…Wow – that is some dedication to the pancake! For children I really do recommend no more than 1 or 2 pancakes. Best eaten after a meal so that they are quite full anyway and less likely to demand more. It’s an easy trick to help moderate the amount they are eating especially if it is billed as their pudding and nothing else. You’ll notice a few things about this list – firstly there is no lemon and sugar (clearly way too retro for 2019!!) but also that every one of the top 10 is sweet. Apparently over three quarters of all pancakes consumed on pancake day will be sweet rather than savoury. Toppings don’t all need to be squirty cream and sugar and they don’t have to be overloaded either. Try to focus mostly on fruit and if your child will eat a natural yoghurt or a high protein and naturally low sugar flavoured yoghurt (like the Skyr brand) then that is better than squirty cream or ice cream. At the end of the day, enjoy the pancakes but look at minimising the damage. If you know your child really will want a chocolate spread then ensure that what they eat over the rest of the day is very wholesome and nutrient rich and aim to persuade them to have fruit with it too and no more than 2. Heat a pan, melt a little coconut oil and gentle cook the pancake, turning after a few minutes.